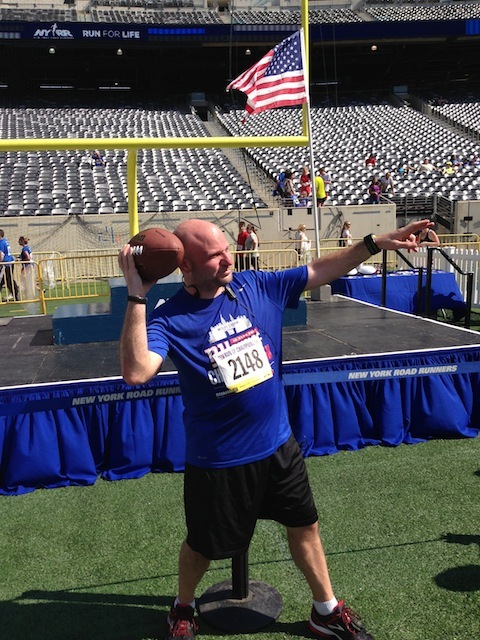 After running it last year, I decided I wanted to be able to run the field with a football, so that I could run down the field and get the touchdown with an actual ball. While this was a good idea in theory, I downplayed the heat in my memory and was more concerned with the ball than hydration. The New York Giants Run of Champions 5K began outside the Metlife Stadium, where I started with a couple fellow members of Team Determination. For the first mile and a half, I was easily keeping up with my friend Carolann, who was running about a 7:30 per mile pace. Since the race lacked any shade and was on blacktop, the heat began to get to me. Soon before the two mile marker, I began to really feel the heat and started to fade. I pulled to the side and slowed down to try and keep the heat from getting to me. There were water stations at the one and two mile markers, but they were barely enough. I continued through the parking lot, but was forced to walk part of the large hill that crested just before we headed to the stadium. I felt a second wind as we ran along side the monument to athleticism and went into the tunnel that led onto the field. I pushed myself as I stepped onto the astroturf and around the edge to the field and a triumphant 100 yard dash, ball in hand, to finish the race. Once the race was done, I moved to the side and the heat and dehydration hit me again. To the point of almost vomiting. I grabbed a couple cups of water and went to the medical tent to rehydrate and sit for a little while in shade, with medical attendants nearby, should I really feel the need for help. Even with the heat and dehydration, I was able to finish the 5k in 27:11, with an average mile of 8:46. I’m happy with my time, but disappointed because I started so strong and held that 7:30 for almost two miles. 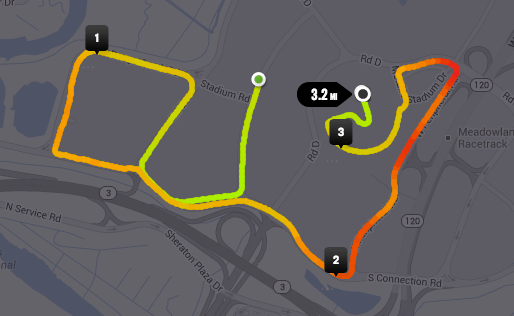 While the New York Giants Run of Champions 5K is a fun race, having it open to the sun on such a hot day is detrimental. Perhaps next year I will run the 3.1 miles carrying a bottle of water instead of a football.